OVIASC has hired as Lead Archaeologist Andy Hemmings Ph.D. Andy is a Florida trained archaeologist and expert on the oldest Paleoindian sites in the United States. He received his MA and Ph.D from UF, and has worked extensively in Paleoindian archaeology and anthropology. His research interests have focused on the earliest Americans, their cultures, tools, and deposits. Working at Florida sites like the Sloth Hole, Acilla and Wacissa Rivers, and submergered environments in Florida, Mexico and elsewhere, Andy Hemmings is one of Florida’s most knowledgeable and experienced experts on early human presense in the Americas. He is currently a professsor of archaeology and anthropology at Mercyhurst University in Erie, Pennsylvania, but lives much of the year outside Gainesville. Members of the Old Vero Ice Age Sites Committee join archaeologist Andy Hemmings Ph.D, Dr.Thomas J. 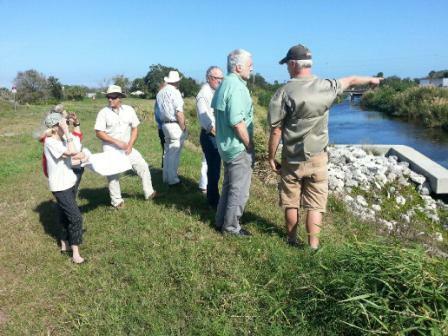 Gamble, president of Mercyhurst University, and Dr.James Adovasio, director of the Mercyhurst Archaeological Institute at the Old Vero Site earlier this year to discuss the Jan. 2014 dig.